Click Here to view Retired Breeding Dogs. Buck was born August 19, 2016. We bought him from outside and he brings great new lines to our litters. Click Here to view Buck's lineage. 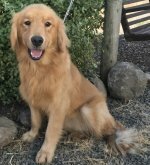 Cooper is from a great hunting line and is a beautiful Dark Red Golden with a personality that will win anyone over! Click Here to view Cooper's lineage. Lady Addison of Oak Grove was born on November 11, 2014. Her parents are Princess Lilly and Sir Rusty of Oak Grove. She is Medium Golden in color and weighs about 60 pounds. Click Here to view Addison's lineage. Elsa's is a Light Golden. Her parents are Sadee May and Cody, which are both lighter in color and are extremely well tempered. Click Here to view Elsa's lineage. Her parents are Lady Daisy and Sir Cooper. She is Dark Red and a very sweet girl. Click Here to view Lacy's lineage. Her parents are Lady Ashley and Sir Rusty and she was born Oct. 1, 2012. She is very Dark Red Golden and has a beautiful flat coat with long feathers. Click Here to view Millie's lineage. Missy was born on April 29, 2017, and her parents are Millie and Cooper. She is a Dark Red Golden with a very sweet personality. Click Here to view Missie's lineage. Molly Mae 2 is the daughter of Princess Lilly May and Sir Rusty Lawson. She is a beautiful Medium Golden with long beautiful feathers. Click Here to view Molly May's lineage. Pepper is a beautiful Dark Red Golden. Her parents are Cody and Isabelle, who have great lines. Click Here to view Pepper's lineage. Piper is the daughter of Lady Sage and Sir Cooper. She is Medium Golden in color. Click Here to view Piper's lineage. Lady Sage of Oak Grove was born on June 27, 2013. Her parents are Sir Rusty and Lady Ashley. She weights about 55 lbs. She is very small and petite. Click Here to view Sage's lineage.